Publisher: Geoffrey Nevine March 18, 2017 This information is provided solely as a guideline. Skin tags are non-cancerous tumors that appear as bits of flesh or dark-coloured bumps, usually around the neck or chest area. Many people develop skin tags in middle age and there is a belief that they appear due to genetics or weight gain. I developed skin tags in my 20s and had them removed using laser technology. However, a few years later, they started to grow again. I have always been slim and none of my parents had skin tags. Therefore I decided to research on the real cause of skin tags. They are triggered by a growth factor-triggered by insulin. If you have them, this is an indication that you’re consuming too much sugar or you did at some point in your past. Thus, to prevent their growth, you need to monitor your diet. Mix some bicarbonate of soda with castor oil and apply on the affected area at night. Do this for several weeks until the tags fall off. This is an excellent remedy for various skin issues such as acne, cold sores and chicken pox. Soak a cotton ball in the oil and rub on the affected area. Repeat twice a day for as long as required. Apply some fresh garlic juice on the skin tag at night and cover with a bandage or plaster. Use warm water to remove the bandage/ plaster. Garlic juice can burn the skin so you should not use it daily, but every third day until the skin tag falls off. Tape a banana peel to the skin tag leave it overnight. Repeat this procedure for several weeks till the tag falls off. Clean the affected area with warm water and dry it. Soak a cotton ball in apple cider vinegar and place it on the skin tag. For faster results, put a bandage over the cotton ball to hold it in place for as long as you can. Do this once a day for 10 days or until the tag falls off. Rub a slice of ginger on the affected area and it the tag should be gone within two weeks. Apply fresh pineapple juice twice a day until the tags fall off. 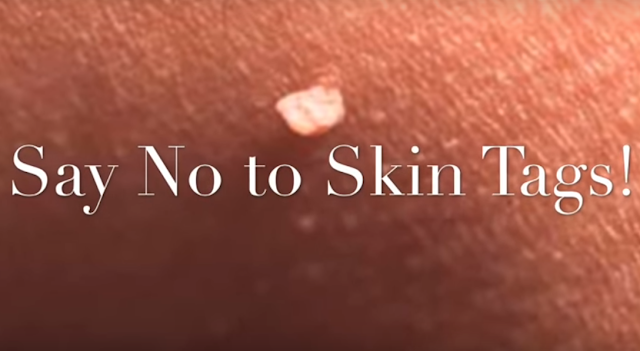 Skin tags are usually benign, however, if you’re not sure, consult a doctor before trying out these natural remedies.